Southern California homeowners do not really have an off season when it comes to outdoor entertaining, which can make it a bit more difficult to find new, fun activities that will make your parties memorable and keep your guests coming back for more. Since we are fortunate enough to be able to entertain outdoors any month of the year, we can also partake in outdoor games at these parties, which greatly expands your options for including fun activities in your party planning. Carnival-style games are always good options and work for almost any age, so simple games like ring toss, balloon dart board and bean bag toss should definitely be on your list of possibilities. Another thing that is nice about carnival games is that you can almost always find some easy DIY directions to make these games on the cheap as a do-it-yourself, pre-party project. Other easy options include all of those outdoor games we played as kids, including freeze tag, three-legged race, volleyball, badminton, lawn bowling, ladder ball and Simon says. Below you will find 10 more outdoor party game ideas to get your creative juices flowing and help you come up with party games that will work well with your theme or for the type of guests you are expecting. Children’s parties are fun to host, but they always go better when you have plenty of activities planned and ready to go. If you happen to have a party theme, it is best to choose games, crafts and other activities that go with that theme. If not, you are free to simply choose games that are the best options for the ages and fitness levels of the kids who will be attending the party. You will need two inflated balloons per child (plus extras, in case some pop), yarn, scissors and a way to play music. The balloons should be in two colors so that you can divide the kids into two teams. Tie a balloon in their team color to each ankle on each child. To play the game, the children walk around as the music plays. When you stop the music, they do their best to stomp on the other team’s balloons to pop them while trying to keep their own balloons from being popped. Once both of a child’s balloons have been popped, they sit out the rest of the game. The team with the most balloons still inflated wins the game. Scavenger hunts are fun competitions that give children the opportunity to learn while they play. This works particularly well in a large backyard with a variety of landscaping features and natural attributes, but it can also be accomplished in a smaller setting. You will need bags or baskets for the kids to use when collecting items and a list of items you know kids can find in your backyard. Depending on your backyard landscaping, your list of objects for the kids to find might include a rock, a pine cone, a feather, a flower petal, different types of leaves, a vegetable or fruit, a piece of bark or an herb. You can have them play individually or divide them into teams, which is usually more fun. The child or team that finds all of the objects on the list fastest wins. This one takes a little extra pre-party prep, but if you are hosting a party for younger children it is sure to be a hit. Before your party guests arrive, you will need to acquire a plastic pool, magnetic tape and plastic toys for prizes. You will then need to fashion some fun fishing poles out of thin branches cut from your trees or sticks sturdy enough to hold the weight of the magnets and toys. You will need to tie one end of the string around a piece of magnet and the other end around the stick or branch to make the fishing poles. Then you will need to cut some of your magnetic tape into small pieces, remove the backing, and attach one piece to each of the plastic toys. Put just enough water in the plastic pool to allow the toys to float and add the toys to the pool. Then you simply distribute the fishing poles to the children and let them fish for their prizes. There is nothing wrong with relying on some old favorites that you enjoyed as a youngster. The water balloon toss game is definitely a good example of one of those older games that kids still enjoy. To prepare for this game, you will need to fill enough balloons with water to have at least one for every two kids at the party. To play the game, divide the kids into teams of two and have them stand in two lines facing each other. After each toss of the balloon from one partner to the other, everyone takes one step back so that the kids continue to get farther apart. When a team’s balloon pops, they are out for the rest of the game. The last team standing with an intact balloon wins. A ping pong table is a great investment for homeowners who host a lot of parties. Children and adults love the game, and it is an easy way to keep people busy while you set out appetizers or prepare the next activity. Adult parties do not always include games, but you can have a lot more fun if you include some in your party planning. Everyone expects good food, good drinks and good company, but craft projects, fun games and other activities can really set your gathering apart from others and make it a memorable affair. You can always go with board games or card games to keep things simple, but if you are hosting an al fresco social gathering, it might be more fun to incorporate a few outdoor party games. If you are concerned about your guests not mingling, playing Who Am I? is a great way to break the ice. To prepare for this game, purchase some sticker name tags or labels and write the name of a famous person on each one. As your guests arrive, stick one of the labels on their back and send them off to the party. Your guests will then need to ask yes and no questions of each other to try to find out who they are. They can only ask each guest one question at a time to help them determine what the label on their own back says, so this is sure to keep your guests circulating. This is an easy game to play that requires almost no preparation. As long you have a couple of oranges on hand, you are in business. Divide your guests into two or more teams (depending on how big your party is) and give each team an orange. The teams stand in a line and must move the orange from the beginning of the line to the end of the line by passing the orange from neck to neck using their necks and chins to hold and pass the orange. The first team to successfully deliver the orange to the end of the line without dropping it is the winner. Croquet works for serious parties, silly parties or parties where you want to feel just a little bit fancy. There are rules and particular ways to layout the playing field, but if you are just playing with friends in your backyard, feel free to set up your wickets however you wish and make up your own rules as you go along. Since croquet can be a relaxing game or quite competitive, this is one option that works for a variety of types of guests and a variety of parties. Giant chess sets make for fun outdoor party games and look pretty cool in between parties. There are portable options available that you can put away when not in use, but if you need a higher-end look to match your landscaping, you can have a permanent one installed using paving stones and artificial grass. Chess can be a spectator sport, so some guests can watch while others play, but you can also divide your guests into teams, which is particularly helpful if you have some guests with more chess-playing experience than others. This outdoor version of beer pong is for adults-only gatherings with previously determined designated drivers. Similar to the indoor version, yard pong involves getting a round object into a receptacle of some sort. If throwing ping pong balls into solo cups does not remind you too much of your college years, you can always just move this game outdoors on a folding table. 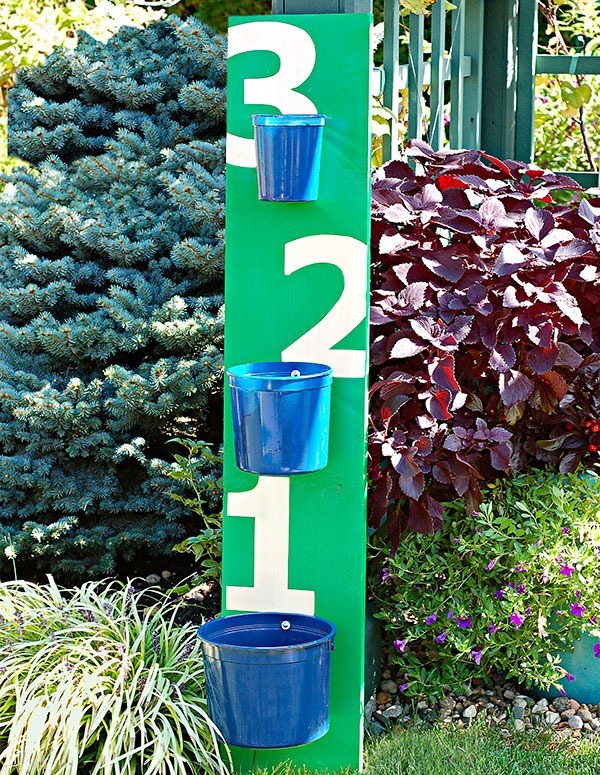 If you would like to go bigger or bring a new aspect to the game, consider using five-gallon buckets and toy balls instead. 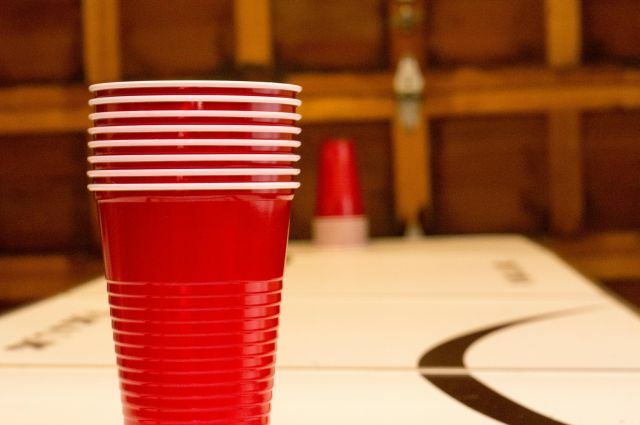 You can purchase over-sized, outdoor beer pong sets from companies like BearPong, or you can head to your local home improvement store for five-gallon buckets and your local toy store or big box store for plastic, inflated toy balls. This will definitely end up being a spectator sport at your soiree, so do not worry too much about the idea that really only two to four people can play at one time. While you cannot guarantee that a drunk guest will not trip on your patio or that a child will not fall and skin his or her knee, there are steps you can take to make safer playing surfaces for your guests to enjoy. This is a particularly good idea — and even more worth the investment — if you plan on becoming a regular party host or are already well known for hosting some of the best parties of the year. 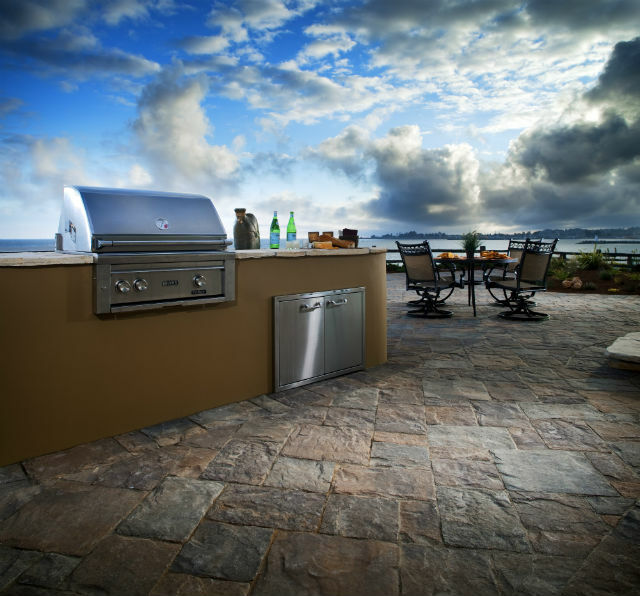 One way you can make your patio safer and beautify your outdoor entertaining spaces is to replace concrete patios and walkways with sturdy, durable, slip-resistant paving stones. This attractive option can create a safer and more resilient surface on which to host parties while immediately increasing the visual appeal of your entertaining area and over landscaping. In addition to paving stones, you can create safer playing surfaces for pets, children and games by replacing natural grass lawns with artificial turf. Synthetic grass provides a level surface without the hills and holes common in natural grass, which can reduce tripping hazards. If you plan on playing yard pong on your grass, having lots of children enjoying soda or ice cream in your backyard, or sharing your game-playing lawn area with pets, artificial grass is definitely the way to go. It is easy to clean and requires very little maintenance to always look its best when guests arrive. If you are concerned that artificial turf might be difficult to care for, you should definitely read our previous article The Ultimate Guide: How To Properly Clean and Maintain My Artificial Grass to see just how easy it is to care for and how it makes a fantastic, low-maintenance alternative to natural grass. What are your favorite outdoor party games? Do I Need to Relocate Downspouts for Concrete or Paver Driveways?